They are (yes, again…) very simple and quick 🙂 For the Daikon in lemon just slice a 10 cm chunk of daikon into thin rounds, grate 1/2 tsp of organic fresh lemon peel, squeeze out one tablespoon of fresh lemon juice (or just half a tablespoon if you like less sour), mix all together in a small pot with a thick bottom and stir over a low flame for a few minutes. The daikon should not be too soft. Add 1/4 tsp of salt to get the daikon´s juices out and you can add a bit of water if necessary, to prevent burning. For the Carrots sweet and sour slice one big carrot into matchsticks, combine in a small pot with 2 tablespoons (or 1 or 1 1/2 tbsp if you like less sour) of ume plum vinegar and stir for a few minutes over medium flame until the carrot softens up a bit, then stir in one tablespoon of rice malt. At the end you can mix in about one tablespoon of roasted sesame seeds. 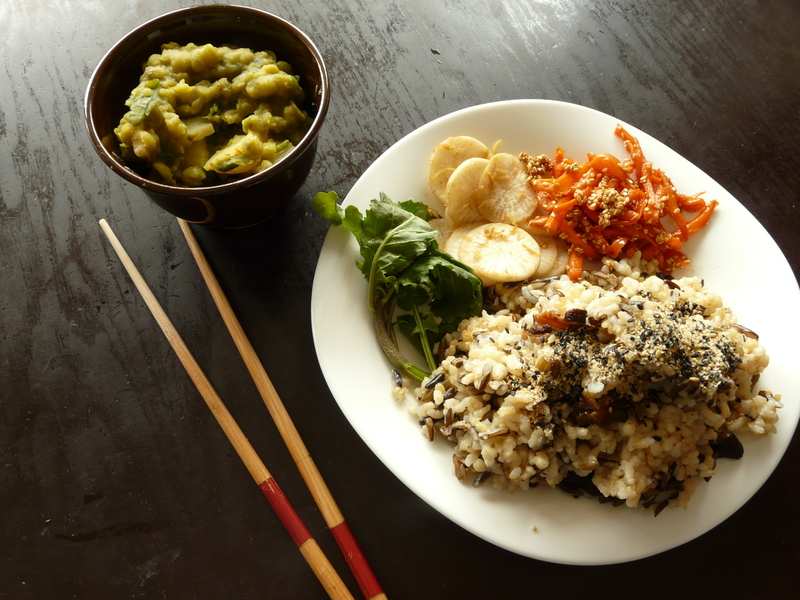 I served these meals with rucola and a side of brown rice+wild rice mixture (with stirred in dried shiitake which I soaked, cooked first in a bit of water, and then, when the water was almost gone, added one tablespoon of shoyu and cooked again until all liquid evaporated). Garnished with black sesame/brown sesame gomasio. For protein I had cooked split peas reheated with salt, fresh celery leaves and sliced parsnip. A great way to embrace the new season – though it feels more like summer here in Britain. Thanks for all these wonderful ideas! I’ve made the sweet and sour carrots with sauteed cabbage, tofu, wild garlic and rice. It was delicious!!! Really fresh and springy meal 🙂 Preju krasny Velikonoce! Thanks! Cool to hear somebody is actually using these recipes 😀 Krasne Velikonoce! Oh I’m sure many are 🙂 I’m personaly always looking for new ideas and am not creative enough to come up with them on my own (at least not when I’m this sleep deprived :D)! So really, thanks a bunch.